Have a question on Omni? Omni is available in 4 different colors - Superior White, Metallic Silky Silver, Metallic Pearl Blue Blaze and Fantasy Black. Watch latest video reviews of Maruti Omni to know about its interiors, exteriors, performance, mileage and more. Maruti Omni is one of the oldest cars from the Japanese car maker serving the Indian masses. Maruti first introduced the Omni in the year 1984 after it started its operations in the subcontinent. Its last major facelift came in the year 1997 and that’s also two decade ago. Despite being an old car it do sells in decent numbers as compared to its competitors. The company has been regularly updating the car but its age is quite evident. 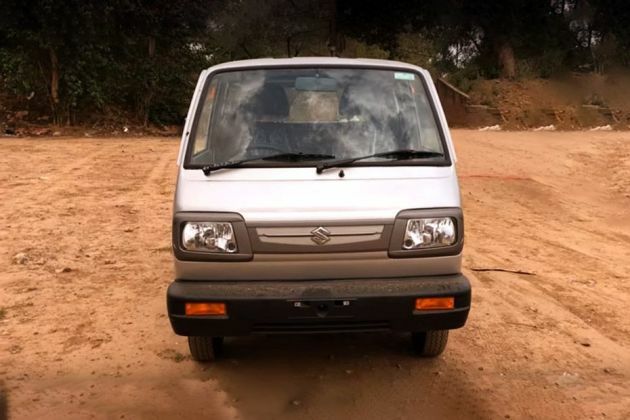 Maruti Omni is the most affordable and frugal urban van designed especially for the large families and usually serving the taxi operators. The car has performed various other roles like people mover, ambulance, courier-delivery vehicle and many more. Though the car doesn’t make sense from a passenger car’s perspective, it is currently the basic, large family transport available at the most affordable price tag. In terms of exteriors, the car carries the old school silhouette. The design and styling is quite out dated but people do prefer to buy the one due to its people carrying ability. And it’s acceptable for this purpose only as it restricts long journey because of its safety factor. The car has the mono-box design, though vehicle has gone through various cosmetic changes in the recent times, it gets rectangular headlamps, chrome radiator grille, body-coloured rear view mirror and black bumper at the front. The side profile gets sliding doors, square wheel arches and small sized tyres. At the back, the car gets vertically stacked tail lamps along with clear lens, hatch tail gate and black bumpers. Dimensionally, Maruti Omni measures 3370mm in length, 1410 mm in width, 1640 mm in height and gets the wheelbase of 1840mm. The Omni is available in four different shades they are Metallic Pearl Blue Blaze, Fantasy Black, Superior White and Metallic Silky Silver. Checking the interiors, the cabin space is quite good and the car is being offered in 5-8 seating layout. The luggage space becomes quite cramped in the 8-seat version Omni because of the third row addition. Seats are covered with the dual-tone upholstery and they are confortable. The dashboard comes with the cup holder and gets space for other utility items. The car comes packed with reclining front seats, floor carpets and glove box with the lock. Maruti Omni gets enough headroom and legroom for the comfortable journey. The limited edition version of Omni gets some additional goodies such as 4 speakers, a CD player that supports an auxiliary port and seat covers. Under the hood, Maruti Omni gets 0.8L three cylinder, four stroke powertrain that is placed under the front seats and transmit power to rear wheels. The engine is capable of generating the power output of 34bhp and belts out the maximum torque of 59Nm, mated to 4-speed manual gearbox. The oil burner returns ARAI certified mileage figures of 16.8kmpl. Maruti Omni is the basic car and its engine is suited for the city driving only. The vehicle reaches 0-100kmph in 20 seconds and gets the top speed of 126kmph. As per the safety, Maruti Omni gets no safety aspects to speak about. That’s surprisingly a big miss, driving is too risky. But it do gets 2 speed windshield wiper, front seat belts, multi-function levers, 3 position cabin light, headlamp levelling device and high mounted rear stop lamp. Maruti Omni is available in three variants such as STD, STD BS IV and Ambulance. The price of this budget friendly car starts from Rs. 2.72 lakh and goes up to Rs. 3.06 lakh. The base trim Omni MPI STD is tagged at Rs. 2.72 lakh. The top selling model Omni E MPI STD BS IV is available at the price tag of Rs. 2.74 lakh while the Omni MPI Ambulance is tagged at Rs. 3.06 lakh, ex-showroom. Maruti Omni is seriously not meant for creature comfort. Call it disappointing or something else, the cheap price is because of the lack of proper interiors. The build quality is awful and the plastic quality and fit and finish is below average. There is however, two-tone upholstery that adds some touch of quality. The creature comforts are deliberately kept minimal as the focus is more on utility rather than cosiness. One would not even find basic comfort features such as air conditioner and power windows. One area where the car shines is the space. The car is being offered in 5-8 seating layout and that is plenty for a large family. The sliding doors have always been the talking point of the car as it allows easy ingress and egress. The car comes with reclining front seats and adjustable front seat head restraints. In terms of space, there is a large glovebox compartment that comes with lock. The dashboard also features cup holders and space for storing utility items. The boxy design of the car is what makes it different from other cars in the market. No matter the poor build quality, the neat and compact design doesn’t look offensive to eyes. The front consists of square-shaped headlamps fitted in the plastic grille. The headlamps come with levelling functionality. The front and rear bumper features thermoplastic bumper and laminated glass windshield. The side carries signature sliding doors, squared wheel arches, body graphics and high roof as well as plain ORVM on the right hand side. The rear profile consists of a large windshield, long tail lamps and a large boot door which comes handy while loading and unloading cargo. Despite the people mover, the vehicle doesn’t compromise in terms of mileage. The Maruti Omni offers a decent mileage of 16.8kmpl which is pretty much acceptable looking at the category in which the car falls in. If you are expecting hatchback like comfort from this car, then this is not the vehicle for you. The car comes with McPherson strut suspension at front and leaf spring with shock absorber at the rear. This does the decent job in absorbing minor potholes while small road undulations won’t bother the occupants. However, don’t expect much from it and throwing the car into corners might get you into tight spot. The ride quality and handling is below average with the car feeling wobbly at high speeds. Maruti Omni features 796cc 4-stroke 3-cylinder water cooled petrol engine that produces 33bhp and peak torque rated at 57Nm. The engine is mated to 4-speed manual gearbox that sends power to the rear wheels. The powertrain is not pleasing to drive if we compare it to the cars available today. But it does the decent job within the city premises while it is not a recommended highway cruiser. As long as you don’t push the car beyond 80-90kmph, the vehicle feels stable. But after this point of speed, the engine starts banging. The safe speed of the car is under 70kmph but given the amount of safety features, it wouldn’t be safe to push this car above 60kmph. The front wheels contains disc brakes while the rear features drum. So, it does the job of stopping the car from moderate speeds. In the safety department, this vehicle is one of the most unsafe vehicles running on the streets and anyone with a slightest concern for safety would not go for this car. However, looking at the price point, we can’t complain much but safety always comes first. Though, you get front seatbelts, rear static seatbelts, steering lock, 2-speed windshield wiper, multi-function levers and high-mounted rear stop lamp. What is the price of Maruti Omni? On road prices of Maruti Omni in New Delhi starts from ₹ 2.69 Lakh for base variant MPI STD BSIV, while the top spec variant MPI Ambulance BSIV costs at ₹ 2.94 Lakh. What are the colors options available in Maruti Omni?